The SENNEBOGEN 718 is a multi-functional machine, purpose-built to dismantle and handle trees and large branches ten times faster than conventional methods. With a single operator and a compact footprint for easy transport, the agile unit moves freely across both urban and rugged terrains - cutting and stacking trees at night and during inclement weather. The engineering behind the 718 has resulted in a machine that incorporates a powerful engine, a robust axle and frame, and provides maximum reach and lifting capacity to tackle old-growth timber. Our design development teams made sure the operator had total charge with precision handling, full visibility, and complete cab comfort. The turbo-charged, 4 cylinder GF-4 diesel engine offers more power and reduced engine noise during operation. The three micron level continuous filtration system starts pumping as soon as the engine starts running to keep dirt and water out of the system for cooler operation and extended service from engine components. Consists of 3 side-by-side, thermostat-controlled cooling units to maintain ideal operating temperatures of the hydraulic oil, radiator water, and engine. This is accomplished with a hydraulics-driven reversing fan that will cycle in the opposite direction when an over-heated condition is sensed. When high temperature levels are sensed at any of the three coolers, the fan will rotate in the opposite direction to pull accumulated dust and debris from radiator fins - which increases air circulation to reduce operating temperature. The 718 features a grapple that rotates 280 degrees and tilts 180 degrees to simulate the movement of a human hand for precision control and lumber handling. The telescopic boom has a lifting capacity of 12,000 lbs. when fully extended vertically (48 ft), and 3,700 lbs. when fully extended horizontally (43 ft). Conventional tree cutting methods are slow and labor-intensive due to the heights and weights that timber presents. The 718 makes single-operator command of both urban and off-road terrains easy. Individually-controlled outriggers allow for stable and fast repositioning of the equipment, without the need for leveling. To keep the 718 running smoothly, key components are at ground level for easy access to the side-mounted engine, filters, compressors, starter, and alternator. Equipment wear parts are purposely located for direct access to improve maintenance and reduce non-productive downtime. The hydraulic oil filter is the only top-mounted component, and that area is completely surrounded by a safety railing for full protection while on the upper carriage. An easy verification to isolate a non-working function is purpose-designed to eliminate frustration during trouble shooting. Each main circuit is represented by a red LED indicator light. An illuminated light indicates the circuit is energized and the cable is intact. Attention can then be directed to a malfunctioning solenoid coil or an inoperable valve - instead of wasting time locating faults. With stairs located on both sides of the upper carriage, the operator has cab access from either side without re-positioning the carriage. The 718 features sliding doors for improved cab access and a catwalk with full safety railings to maintain 3 points of contact the entire way. 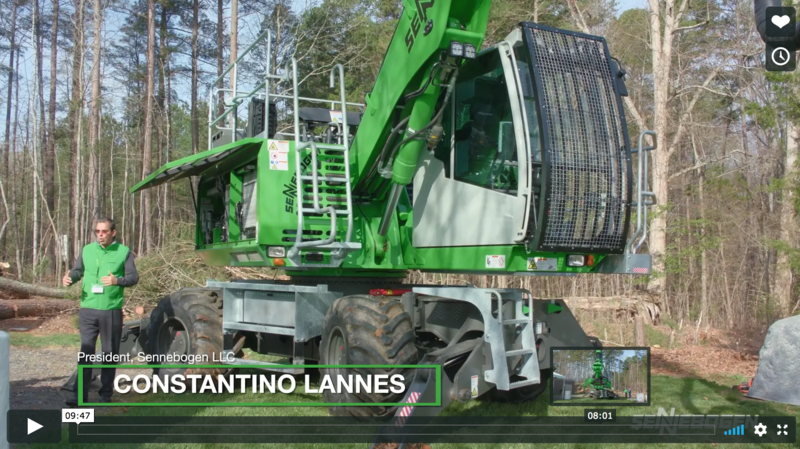 The front cab elevates to an eye level of 18 feet and tilts back 30 degrees to position the operator at an optimum height for handling taller trees. The operator cab features air suspended seats that absorb vibration and offer a more comfortable operating experience. Air suspension seats also absorb shock, which helps to reduce the occurrence of back pain on rough terrain. The operator will enjoy the climate-controlled air conditioning, heat, and heated seats for year around comfort. Complete visibility is assured with full front and side windows and a rear view and right side camera system. All controls are hydraulic which simplifies troubleshooting. By connecting a pressure gauge to each port, you can determine which circuit needs attention as determined by the pressure reading. All low pressure control valves are stamped for easy identification and centrally located on one panel for easy troubleshooting. The main control valve is conveniently located at a high level for access from the cab platform for easy adjustment or maintenance. The continuous lubrication system coats every single pin and bushing from the start of the workday to its end. This means reduced maintenance and improved component life. The centrally mounted electrical panel contains and protects all relays and fuses. Each component is labeled for simplified troubleshooting and makes it easy to order replacement parts. To make electrical troubleshooting as straightforward as possible, the back of the panel cover has the electrical diagram with a list of all fuses, relays, and their function. The circuit breaker panel is located near the electrical panel for fast and safe disconnect of faulty circuits, and houses the main battery disconnect switch for total shutdown. Want To See The 718 In Action? 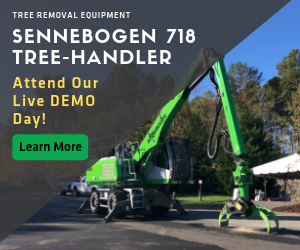 Learn more about the Sennebogen 718 at one of our upcoming Demo Days to discuss the challenges facing tree service business owners. This is a great opportunity to learn about the impact this equipment is making within the industry - on productivity, safety, and profitability. You will also tour our facility and have a chance to speak with operators who are currently using the equipment in the field for a first-hand testimony of the benefits the 718 offers to the tree cutting industry.